CMA CGM Benjamin Franklin is an Explorer class containership built for CMA CGM. Delivered in November 2015, she is named after United States Founding Father Benjamin Franklin. She is one of the largest container cargo vessels, capable of carrying 18,000 TEU. 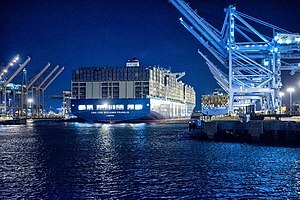 The December 26, 2015 arrival at the Port of Los Angeles  marked the first time a ship of this size had been used in North America - previous routes for a ship this large were only from Asia to Northern Europe. Benjamin Franklin is about a third larger than the biggest container ships that typically visit the deep water ports of southern California. After departing Long Beach, she traveled north along the West Coast of the United States, arriving at the Port of Oakland near San Francisco on December 31, and at the Port of Seattle on February 29, 2016. The U.S. tour was short-lived, however, as CMA CGM postponed deployment of megaships to the West Coast in May 2016, citing a lack of demand. The Benjamin Franklin is propelled by a MAN B&W 11S90ME-C9.2, a low speed, two-stroke diesel engine. The MAN B&W 11S90ME-C9.2 was designed in house by MAN B&W with the goals of the lowest possible operational costs and fuel consumption at any load and any prevailing condition. MAN B&W ME engines have design and performance characteristics in order to comply with International Maritime Organization Tier II emission regulations. This engine has electronic hydraulic activation in order to increase flexibility with regard to fuel injection and exhaust valve activation. These two factors are adjusted in order to match operating conditions that a ship may be under. This electronic control of the start to finish of the combustion process is known as the Engine Control System. Fuel injection controls the speed in which the engine will be operating at, while the exhaust valves control the exit of combustion gases from the cylinder. The actuators for fuel injection and the exhaust valves are electronically controlled by the Engine Control System. For fuel injection, a plunger powered by a hydraulic piston is started with oil pressure. Oil pressure is regulated by a valve that is electronically controlled through the Engine Control System. Exhaust valves are opened by a two-stage exhaust valve actuator which is activated by oil delivered from an electronically controlled valve. By controlling these valves electronically, the combustion process is fully controlled by the Engine Control System. The frame of the cylinder is cast and fitted with access covers for the routine cleaning of the scavenge ports on the cylinder liner, a unique characteristic of two-stroke engines. The cylinder liner is produced with alloyed cast iron and contains scavenge ports as well as drilled holes for lubrication. Air intake takes directly from the engine room to the turbocharger fitted to the engines. From the turbocharger, air is sent to be cooled through a sea water cooler then stored in a scavenge air receiver. This air is then sent to the scavenge ports on the cylinder liners. Exhaust from the exhaust valves are sent to a receiver to equalize the different pressures produced from each cylinder. The exhaust gases are then sent through turbochargers. The CMA CGM Benjamin Franklin was designed to meet CMA CGM’s goals of a sustainable policy that aims to reduce greenhouse gas emissions and the protection of biodiversity. CMA CGM was able to improve its Carbon dioxide emissions by 50% since 2005. Through the electronically controlled fuel injection with the MAN B&W’s Engine Control System, the consumption of fuel has been reduced by 3% and oil by 25% on average. Benjamin Franklin’s hydrodynamics, or water flow, is improved with the addition of a bulbous shape on the rudder. This variation of the rudder, known as a twisting leading edge rudder, optimizes energy performance by 4%. Ballast water onboard the CMA CGM Benjamin Franklin is treated directly when pumped on board and again during ballast operations. The ballast water is filtered and passed under UV lamps in order to detect any living organisms. These living organisms are then killed in order to prevent these species from invading natural habitats. There are no chemical products ejected back into the sea with the Benjamin Franklin’s ballast system. For additional treatment of bilge, grey water, and engine water, the Benjamin Franklin is fitted with an additional decanting tank. This decanting tank is able to separate water from undesirable liquids, by letting all of the liquids settle. The waste products in the liquids are then removed and the remaining liquid is sent for further filtering. The Benjamin Franklin is fitted with CMA CGM’s Fast Oil Recovery System, which is used to manage pollution on board the vessel. The initial deployment of large container ships was seen in the Asia-Europe trade. In the second half of 2010, the vessels in service with Maersk Line’s Asia-Europe trade were 8,500 TEU. By 2013, the vessels in service for the Maersk Line's Asia-Europe trade increased to 18,000 TEU vessels. 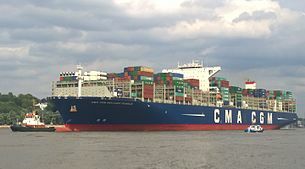 Until the CMA CGM Benjamin Franklin berthed in the Port of Los Angeles in late 2015, nearly all of the world’s largest container ship (18,000+ TEU) were deployed in the Asia-Europe trade. However, 10,000+ TEU vessels represent only 10% of the total global fleet. In comparison, Maersk’s Asia-Pacific trade vessels increased from 8,600 TEU to 9,400 TEU in August 2013. ^ a b c d "CMA CGM Benjamin Franklin (25629K)". Veristar Info. Bureau Veritas. Retrieved 2015-12-28. ^ Nolte, Carl (December 31, 2015). "Biggest cargo ship to ever grace S.F. Bay is here". San Francisco Chronicle. Retrieved February 6, 2017. ^ Tu, Janet I. (February 29, 2016). "Massive cargo ship arrives in Seattle's Elliott Bay". The Seattle Times. Retrieved February 6, 2017. ^ Phillips, Erica E. (May 9, 2016). "Record-Breaking Container Ship Ends Brief U.S. Service". Wall Street Journal. Retrieved February 6, 2017. ^ a b c d MAN (2012). "MAN B&W S90ME-C9.2-TII Project Guide Electronically Controlled Two stroke Engines" (PDF). ^ a b c d e f g "CMA CGM Benjamin Franklin". 2015. ^ a b World Shipping Council (2015). "Some Observations on Port Congestion, Vessel Size and Vessel Sharing Agreements" (PDF). Wikimedia Commons has media related to CMA CGM Benjamin Franklin (ship, 2015) and IMO 9706891. This page was last edited on 14 February 2019, at 16:55 (UTC).